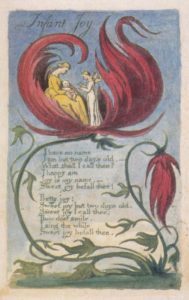 In his attempt to communicate his essential divine vision, William Blake created a poetic world where images are realized in their individual contexts and the contexts are realized in the unique Imagination of the poet. Blake’s philosophy asserts, more than anything else, the contrariety of systems with regard to human soul and other objects of creation. In claiming “without contraries is no progression”, Blake anticipates the duality in human condition that the Twentieth Century philosopher Nietzsche conceptualizes as the Apollonean and the Dionysian aspects of existence. 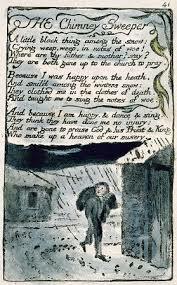 Nowhere is this conception more vividly realized than in Blake’s Songs of Innocence followed by Songs of Experience. Such an intention is clear from his title page that describes the songs as “showing the two contrary states of the human soul”. 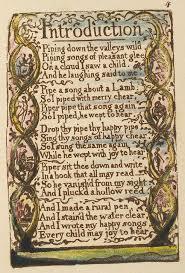 In “The Introduction” to the Songs of Innocence the poet derives a spiritual inspiration from the “child on a cloud. Innocence dwells with wisdom, but never with Ignorance. …Like a fiend hid in a cloud. The child is born out of its mother’s pain, accentuated by the misery that the father’s tears suggest. It is energetic enough to leap into the world, and though helpless and naked, it still has enough primal vitality to be fiendish, while the clouds refer to the swaddling bands that the child struggles against. Blake recreates the myth of the tree of knowledge which is fashioned by man’s reason. It can only propagate falsehood and death instead of eternity. The voice that now speaks does not belong to a caring heart but to a heart turned sour by age, envious of happiness which it can feel no more, eager to point out the menaces of the dark. It is as if, when the lamb is threatened by experience, the tiger is needed to restore the world. However, the poem “The Tyger” is also a series of questions posed in anthropomorphic terms (shoulder, art, dread hand, hammer, chain, and anvil). The cumulative effect of this is to suggest the poetic conception of divinity in terms of doubtful interrogation. However, the ultimate impact is a recognition of the Tyger’s restorative potential. The pastoral charm of the valley of innocence must be set against a morbid graveyard, a dangerous wilderness or even the din and chaos of a city like London, to finally realize the contrariety and correlation of opposites. Only then can an attempt at synthesis be made which Blake so vehemently professed. Please let me know if you’re looking for a author for your weblog. You have some really good articles and I believe I would be a good asset. If you ever want to take some of the load off, I’d absolutely love to write some content for your blog in exchange for a link back to mine. Please shoot me an email if interested. Thanks! When I originally commented I clicked the -Notify me when new comments are added- checkbox and now each time a remark is extra I get four emails with the identical comment. Is there any way you are able to take away me from that service? Thanks! I do not even know the way I stopped up here, but I believed this submit was once great. I don’t know who you are but definitely you’re going to a well-known blogger if you are not already. Cheers!